The beach has a legion of xiringuitos or bars right on the sand and restaurants on the raised walkway along the shore. They are lively but often pricey and in my opinion the music is too loud – we all have different tastes I guess. The other problem is that most only open for the summer season only. For me, however, the beach is a year-round affair, and that’s where Base Nautica comes in. This bar and restaurant is easy to walk past as it’s part of a small sailing club which is right next to the waterline. I came across it when I enrolled my son in a sailing course and found this very chilled spot to read my book, sip a beer and breathe in the sea air. Oh and the music is just the right volume. The demographic seated at the tables shows a healthy mix of visitors, resident expats and locals. 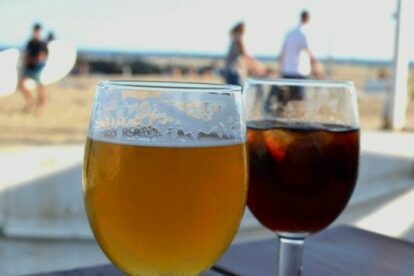 The bar does serve food but the selection and quality are unremarkable, the venue is best kept as a great place to enjoy the beach with a drink and some olives. Should you want to rent a paddle surf or a sailing dingy, then you’re at the right place. In winter, when dogs are allowed on the beach, I often meet my friend Guillem and his dog Negret for a walk. Inevitably, we do an extended stop at Base Nautica and philosophise on life and admire the fine Mediterranean skies as twilight sets in.